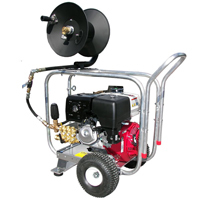 Pro-Jet Drain Cleaners are self contained gasoline powered drain jetters that clean out pipes without damage from moving parts. All units feature Honda motors and GP pumps. 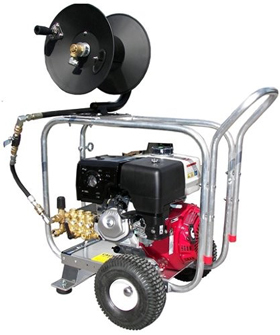 Units include pulsating jetter valve, adjustable pressure, jumper hose, roll cage, aircraft aluminum frame, hose reel, ball valve and jetter nozzle. Pro-Test Hydrostatic Line Testers are ready to pressure test the integrity of pipes and plumbing as required by local codes. Get power and efficiency in this Pressure Pro 4000 PSI Pro-Jet Drain Cleaner (JD4040HG). For cleaning drains, it has a general direct drive pump, along with a general pulsar unloader valve.